When we first created Plastik, our aim was to build a platform on which we could showcase art that pops - a visual platform for artists that never give up on their glittery dreams. It was our way of reacting to the fact that we were living in what felt like a stagnant environment of faded dreams in dire need of colors. As years went by, I traveled around the world where colors never seemed to fade and collaborated with artists of all disciplines hoping to seep in some of that vibrant goodness and yet, to my surprise, each and every one of them was on a quest to find their own rainbow. From California dreaming New-Yorkers to Londoners pursuing the warmth of the Catalan sun, it became clear that colors always seem to shine brighter on the other side. Luckily, the elegant and chic world of print was being out shined by a younger and juicier digital platform, where the proverbial rainbow was no longer across borders but rather at your fingertips. Could this digital platform be our yellow brick road? With Instagram came a whole new set of rules to play with... and so we did. We walked into that club, posting inspirational artwork of our idols while showcasing our own - whenever we wanted, however often we wanted and from wherever we wanted. Artists that we once admired from afar were now a swipe away and soon enough it became clear that the world was but a small town and that it was time to paint it pink. In comes a certain unicorn with a country twang, a mythical figure from tinsel town with bright red lips and a reckless tongue, contacting us on Instagram and asking to collaborate a moment that dreams are made of. The Miley cover was more than a milestone, it was a validation of the fact that nowadays, if you set your mind free, do good work and put yourself out there, you will eventually get recognized and rewarded, no matter where you are from. Glitter sticks to anything but it’s your light that makes it shine. It was not easy being a woman in 1950’s America. The ideal was to be a devoted mother, cozy homemaker and obedient wife on heels mopping floors with a radiant smile and of course dinner would be ready when daddy came from work. A post WWII vibration on the classic three M’s a woman ‘needs’ to embody: the virgin mary, mother Mary and Maria Magdalena. The seemingly perfect world of “female caricatures” in small town suburbia is the main inspiration for New York-based fine art and fashion photography Bamby who mixes the theatrical with a hint of irony, lynch with a touch of Hitchcock. By placing a mundane everyday item in a very classical context, award-winning Australian painter Matthew Quick in his latest series “Monumental Nobodies” forces us to look with a pair of fresh eyes at the notions of past and present, creation and destruction. “the motivations between the creators and destroyers of artifacts are actually the same. 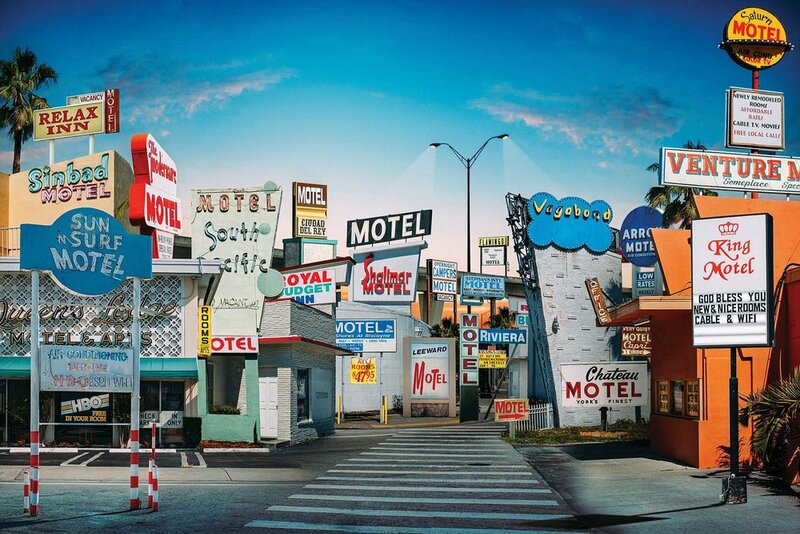 Each is trying, in very opposite ways, to say: ‘I exist.’"
American artist Andrew Soria creates vibrant and colorful urban landscapes using photographs and photoshop. Soria’s skyscrapers, fast food restaurants, pawn shops and neon lights have an almost cartoonish quality, yet offer a critical view on the deeply flawed American dream today. In January 2015, Soria’s series "America the beautiful" won the best in show award at the la baton rouge gallery surreal salon, which every year highlights the growing pop surrealist movement in American contemporary art.
" When I was only a little boy I was crying at a camera store ... I always wanted a camera but my mother thought I’d never use it. How ironic ! " Born in 1981 in a small town near buenos aires, Argentinean artist Romina Ressia nearly lost herself in the hardboiled world of money and finance, but thank god in her late twenties decided to follow her creative dreams. 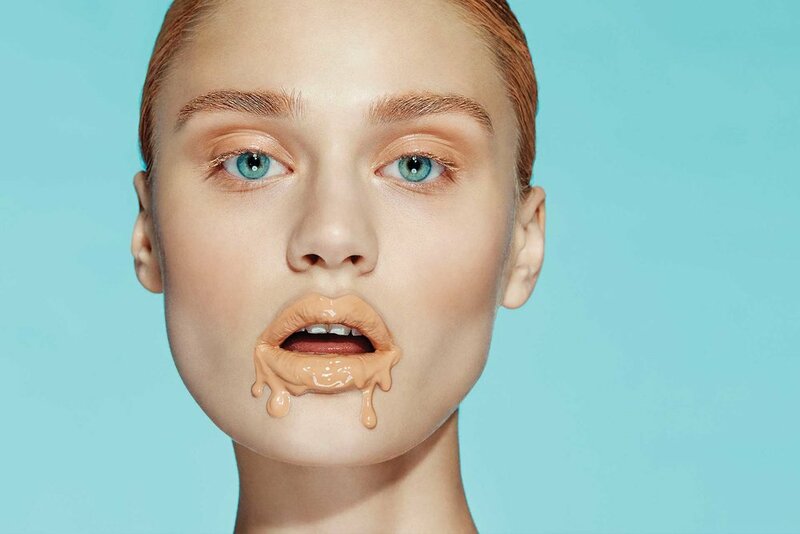 Reminiscent of classic renaissance portraiture and still lifes, her images use such modern day items as a tennis racket, chewing gum or soft drink can to make a comment on contemporary society. Her series "Not about death " shows elderly people dressed up as a superheroes lying in a coffin to confront us in a playful manner with such notions as heroism, death and decay.